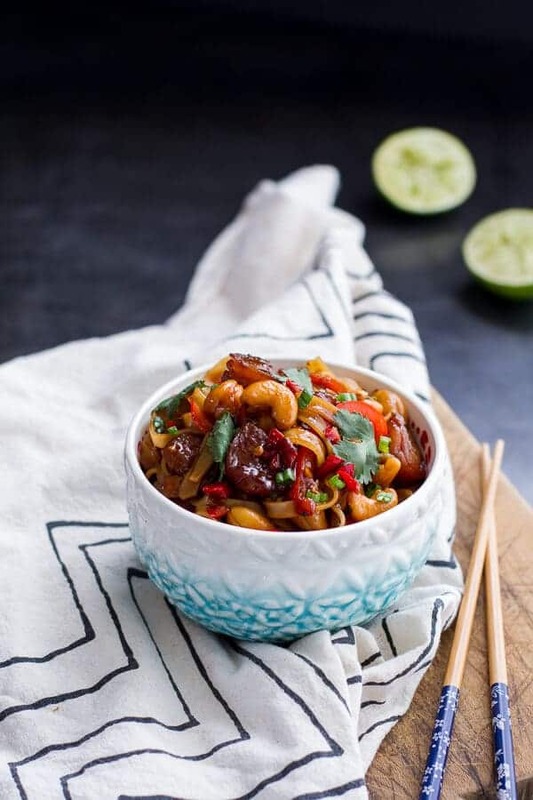 Chili Cashew Shrimp Noodles + Video. 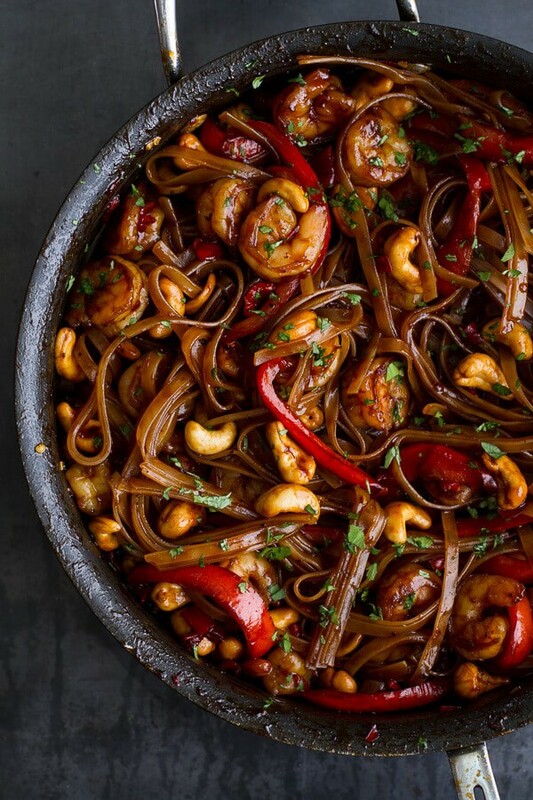 Chili cashew shrimp noodles in twenty minutes. Whoop! Some of my favorite things to cook are the ones that require time, different ingredients, multiple steps and generally just give me a little challenge. Challenging foods get me excited and make me feel like I accomplished something awesome. I know it’s weird, but I love it. With that said, time is almost never on my side, so that is when I get super exited about meals like this. They may not require a ton of time, a ton of ingredients or multiple steps, but they are still just as good. Switching gears for a minute. As you can see, I have new little furry helper. He licks up all the crumbs and rolls his pretty white fur in the melted chocolate. He also sneaks his cute little body into my shots. Keeping him out of these photos was kind of a challenge, since he has now taken over the area next to where I shoot in the family room. He found the giant patch of sun where I shoot and he now sits, plays and basks in the sun while keeping me company as I work. I would like to think it is because he really loves me, but I think he is really just all about trying to sniff out every new food he encounters. Whatever the reason, I love having a buddy around. Especially one that’s snuggly, furry and so cute. When I look at him he just makes me happy. Oh no, turning into a crazy cat lady over here. HELP! I also think that little kids are the devil to little kittens. Somehow I was the lucky one who had to take the cat to school to show Asher’s class of five and six year olds the family’s new little kitty. OMG. The poor thing was tugged and pulled. I just felt so bad for my new little bud. I mean, the word gentle was non-existent to these kids. There was fighting, a few tears and one very freaked little cat that luckily left with all four legs still intact. And I do mean lucky. Never again will the “take the pet to school” thing happen. Switching back to these noodles. Let’s talk about them. 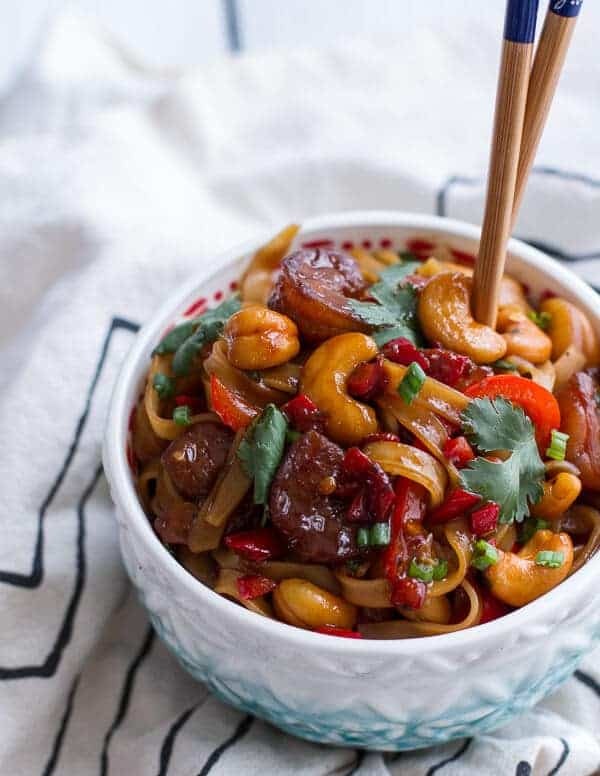 They are everything you love about cashew chicken, but instead of chicken we are using shrimp, and instead of rice – noodles. You know I have been craving all things tropical these days. Seafood being one of them. Really though, I just want it to be spring! And the days to be bright, and the sun to set no earlier than six. Slowly (very) we are getting there though. Yesterday the sun set over the mountain at 5:14. SO much better than the 4:00 sunsets throughout December. Spring is on its way! So these noodles were a winner, but I knew they would be. 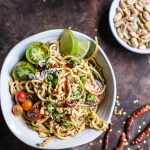 Anything with cashews, shrimp and pasta is hard to mess up… so much goodness in that combo! 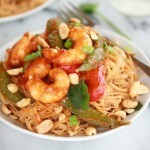 Everything you love about cashew chicken, but instead of chicken we are using shrimp, and instead of rice - noodles! Bring a large pot of salted water to a boil. 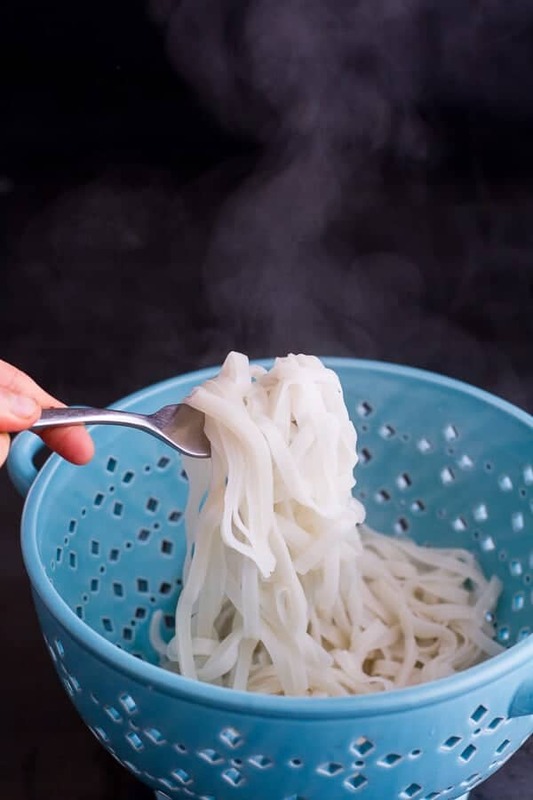 Cook the rice noodles according to package directions, leaving the noodles with just a bit of a bite as they will continue to cook in the sauce. Drain the noodles. In a bowl combine the honey, fish sauce, soy sauce, hoisin sauce and lime juice. Set aside. Heat a large sided skillet or wok over medium high heat. Add 1 tablespoon of the peanut or sesame oil and the shrimp in an even layer. Sear the shrimp until cooked through, about 2-3 minutes per side. Remove the shrimp from the pan. Add the second tablespoon of oil and the garlic, red chillies and red peppers. Saute for 3-5 minutes or until just soft. Add the cashews and stir fry for about a minute. Add the sauce and the shrimp back to the pan, stir and cook one more minute. Add the noodles and stir for 2-3 minutes. Remove from the heat and stir in the green onions and cilantro. Serve. Officially hooked on this meal. Aw! We need more kitty pictures! And that shrimp looks phenomenal (and I’m really not even much of a shrimp person). I need it in my life. Kitty photos in the morning!! Beautiful photos … and cat!! What a cutie!! You are the opposite to me, Tieghan, because I love the easy day-to-day type recipes. But I also love how we’re all different and I enjoy reading about your marvellous ‘tricky’ creations. This easy one, though, is definitely a winner for me! Hi there… I am new to your blog and Loving It!!! My only comment about this recipe is that you didn’t mention what kind of cashews and how much. Thanks so much, Lori! I fixed the recipe. Very sorry about that! Looks wonderful, but I don’t see where you say what kind of cashews and how many to use? Will def need to try this. Thanks Missy! Fixed the recipe. Sorry about that! Love your furry new friend! 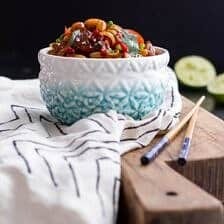 Great pics and love this recipe! Another hit Tieghan!! Aww! I need more kitten photos! Anyway, this noodle dish looks delicious. Love that overshot picture of the big pot. It’s been far too long since I’ve had something like this–homemade or out. 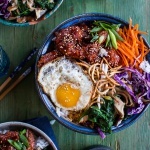 Forget takeout!!! I want this! Wish I could have shared! Thanks Steph! Oh man this looks so good! And that cutting board is amazing! Totally want! Ok, the recipe looks so delish, and I think I will make this for dinner tonight. One other question…..can you tell me where the beautiful bowl is from? Thank you so much! I got the bowls for christmas, but I think Anthropologie! 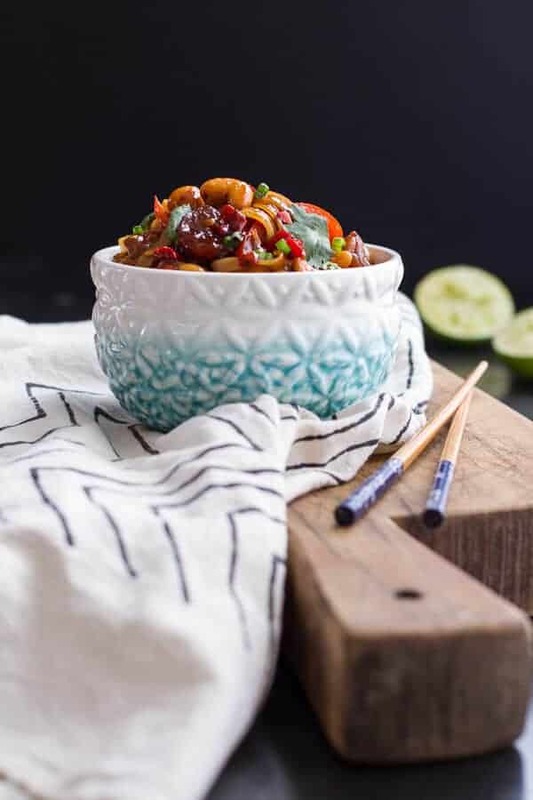 This cashew shrimp sounds so tasty! That kitten….so cute!! This noodle dish sounds amazing, totally right up my alley. Great photos, Tieghan! LOVE this one! I need more fish in my life and this sounds FANTASTIC! Fish Sauce is tricky to find, I have an Asian grocer here so that is good. Do you know how long it keeps for? Thanks Sophia! I have had mine for a few month now and it is still good! 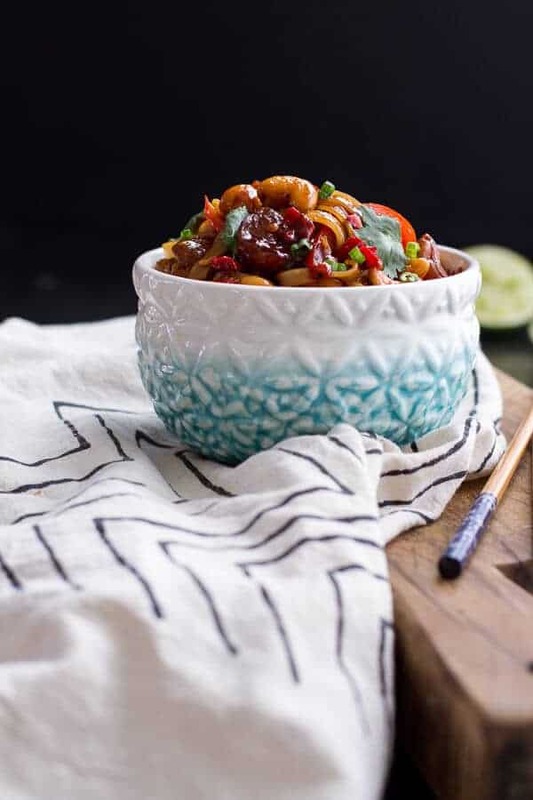 Your kitten is too cute and these noodles look incredible – especially loving the dark and moody skillet shot! Thank you so much, Laura!! I was so unsure over that shot, but I love it now! This looks killer! 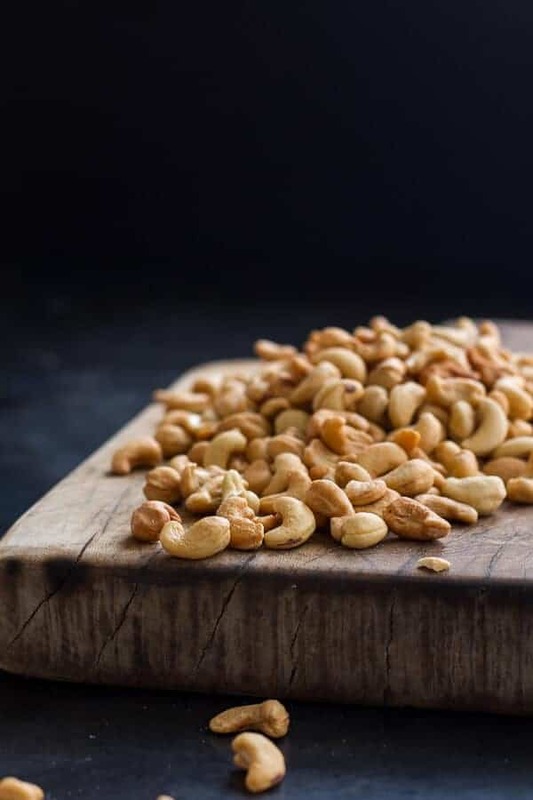 …literally… I’m deathly allergic to cashews. But could I substitute peanuts if I wanted? 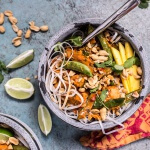 I love any type of asian noodle dish so I am definitely going to try this one out sans cashews! Oh no! Don’t use cashews! Peanuts will work great!! Hope you love this and thanks so much! The colors in this dish are glorious! I also loooove your bowls. I bet little hedwig was suuuuuper happy to get home after being pet a million times by little kids. Oh my goodness these noodles look incredible!! This looks so good! I’ve been craving shrimp like whoa, lately, and I always want noodles. My dogs LOVE to bask in the sun right under the table I shoot on, too. Also…they’re in it for the crumbs. I’m also pretty excited about these longer days to come. SO excite for the longer days!! Can’t wait! This looks incredible! I have this pact with myself to make more noodle dishes at home. Putting this one on the list! not sure if it’s because i haven’t eaten for two days (we won’t go into that ugly detail) or if it’s your recipes, but everything i’ve seen looks sooo dang good! can’t wait to give this dish a go. so glad to have found your lovely page! Two days?!? YIKES! Get some food! Oh my goodness, this looks so good. What a great recipe your family is so spoiled. What’s your furry little friends name? a real cutie for sure. This is totally heaven!! And what a cute little helper!! 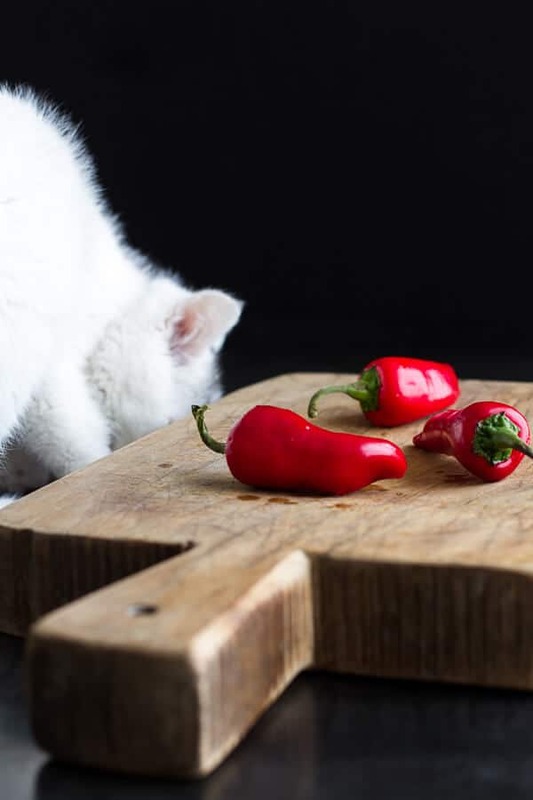 Pets make the best cooking buddies! I know everyone’s different, but how spicy would you say this is this? This looks amazing, but I might need to cut down on the chillis! It is not overly spicy, but if you are worried only use 1 or 2 chile peppers. Thanks so much and I hope you love this! I cannot wait to make this tonight! And guess what? My 5-year old’s name is Asher! I read your post and nearly fell over – it’s not a name I hear often. 🙂 Cheers! Haha! No way!! Thanks so much, Amber and I hope you love this pasta! I made this today and everyone at home loved it!! Soooo goood!!! I am addicted to your page! Love all the recipes they r so much fun to make! The quinua burger was sooo yummy too as well as the jamaican jerk chicken (i used jumbo shrimp) !! Thank u so much for sharing !! Yum! I want to make this but I’ve no soy sauce . Can I leave it out? You can, but I do think it add a lot of flavor. If possible try and get some. Thanks! So, this looks very good. AaaaaAAnd I’m not sure if anyone had told you this yet: but it’s kind of rude to stick chopsticks straight up in a bowl. I only mention it because I’ve noticed another photo in which you dug the chopsticks into the dish and they seemed really yummy: so I’m guessing you just weren’t aware that it means you’re offering your food to a dead person. Keep up the delicious looking menus though. I will try to make this one. Thank you so much for letting me know, I did not mean to be rude. SO SORRY! Just made this! It was divine. I added more noodles though since my turned out a bit too saucy. Thanks for all the great recipes! Thanks Kristin!! I’m so happy you liked them!! It was wonderful. We added slightly more green onions and coriander… yumm! !